For most families, Havdalah after the last day of Pesach signifies the mad dash to turn over the house from Pesachdik to chametz...or perhaps the start of the trek to returning home after being away for 8 days. But not for Misaskim. 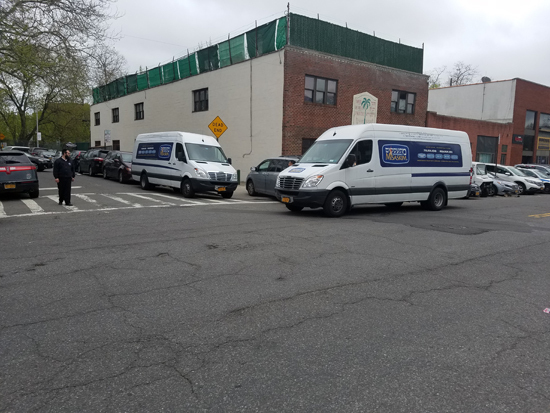 In the first 24 hours since Motzoei Yom Tov, Misaskim trucks, vans, and even SUVs manned by volunteers and staff (see photo), fanned out across the tri-state area delivering shiva-related materials to over 42 homes, encompassing more than 170 new aveilim, r�l. Although it is not totally unexpected, as this post-Yom Tov demand occurs every 6 months, it nevertheless still pushes Misaskim to the limit, both in terms of materials and Sifrei Torah, as well as manpower. Misaskim would like to thank the wives of the volunteers for sharing in this great chessed; it is not easy...but is greatly appreciated by all who have been helped with this unique Mitzvah. Misaskim alleviates tragedy with compassion, coordinates crisis with expertise, and provides a multi-faceted array of services for the bereaved. (01/17/2019) INCREDIBLE! Misaskim Volunteers Sift Through Mountain of Trash And RECOVER LOST TEFILLIN! (01/02/2019) CONGRATULATIONS. . . AND THE WINNER IS. . .